Pelviline is a light, wide and solid vaginal probe suitable for women with prolapse - to be used with electronic pelvic floor toners such as Kegel8 and Neurotrac. Wide, flat probes are popular because their shape and light weight mean they are more likely to remain securely inside the body whilst standing and walking around. Being mobile whilst using your electronic exerciser adds to the effectiveness of the treatment as it encourages the pelvic floor to work harder and become stronger, and it's for this reason that the Periform is one of our most popular probes. However, since the Periform has a hollow middle it is not suitable for women with prolapse as it can damage the prolapsed organ; the Pelviline is the perfect alternative. This Pelviline probe is a brilliant alternative as it's almost identical in size and shape but is completely solid. It's still lightweight and easy to wear whilst standing and walking, but it's smooth flat shape allows women with prolapse to use it safely. There are two stainless steel electrodes, one on each side, and a clever indicator wand which tells you when you are squeezing and lifting your pelvic floor muscles correctly. Having a visual indicator like this is very useful because if you are not contracting your muscles correctly you can do more harm than good. What's more, the Pelviline probe also has an adjustable hilt, meaning that you can insert the probe to the right depth that is comfortable for you, with no danger of inserting the probe too far. This vaginal probe is suitable for use with EMG biofeedback and electronic stimulation machines for pelvic floor exercise. The probe has pigtail connectors that allow it to connect to EMG machines via a lead wire. 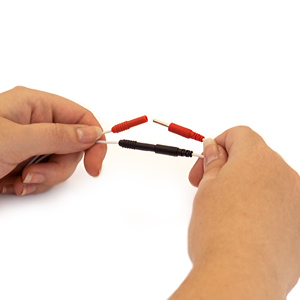 This probe is fitted with 2mm male pigtail connectors and are compatible with most TENS/STIM/EMG machines via your leadwire.